The Velvet Frost Dress (now $300 + 40% off) is under $200 after the Tag Sale promo is applied! The longer the Tag Sale endures the more goodies I notice — it’s time for another look through Anthropologie’s semi-annual sale, where you can take an extra 40% off sale with the code TAGTIME. Very pretty pieces like the Velvet Frost Dress (now $300) are back in-stock (and going fast!) and there were perhaps even a few new markdowns added over the weekend. — or, if you’re like me and get hot at the office, don’t. 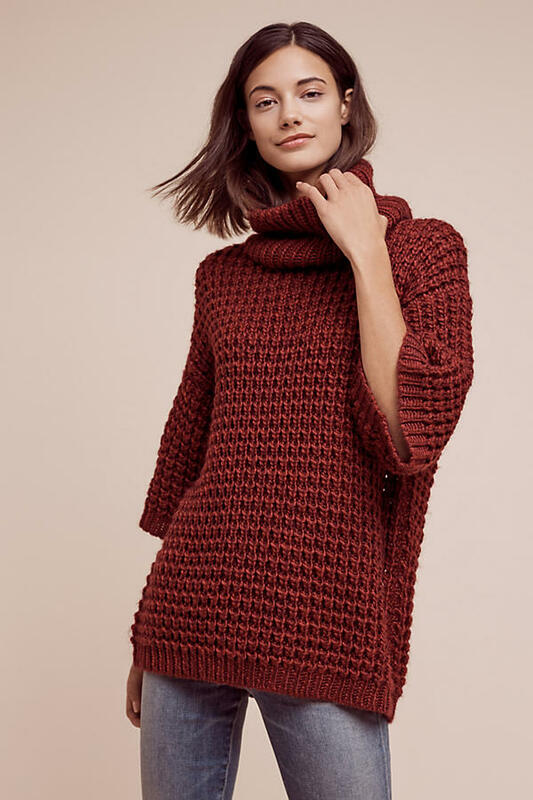 1 | The Waffled Turtleneck Tunic (now $80 + 40% off) is a gorgeous brick red (or dark green) that is great for vacillating office temperatures. 2 | The Todra Cape (now $90 + 40% off) has a warm, beautiful inner lining and a practical faded outer color that makes it multi-season wearable. 3 | If I didn’t already own a creamy furry sweater, the cute Audrette Sweater (now $80 + 40% off) would be high on my list! 4 | We’ve been talking about how great Pilcro has been this season — the Pilcro Serif Mid-Rise Jacquard Jeans (now $70 + 40% off) have a good amount of give to them and are a modern, low-rise style with subtle patterning. I found the black to be lovely. 5 | I was delighted to see that the Celebration Fringe Dress (now $400 + 40% off) popped back this morning, and snapped my size right up!! 6 | The Myleen Velvet Shell (now $80 + 40% off) is a particularly elegant take on the velvet trend. 7 | The Afterlight Wool Dress (now $100 + 40% off) is perfect for work or weekend, all according to what you pair with it. 8 | For warmer climates, the Quilted Chambray Bomber (now $100 + 40% off) is a great winter coat option! 9 | I imagine myself wearing the Umeko Belted Kimono (now $90 + 40% off) mostly around my apartment, but it’d be a great topper for nights out too. 10 | The Patchwork Poplin Buttondown (now $50 + 40% off) is just so lovely for work, or out and about. I have been asking my little blue birdies about further cuts or deeper promo % off in the Tag Sale, and the word is it could happen anytime. No more information than that and that is unofficial, not from the home office. Of the items I’ve ordered so far in the Tag Sale, only one has arrived (and it was a full-price add-on). The rest of my packages are due to arrive this week…however I’ll be up with my Mom this week as we continue preparations to sell my parents’ house, so no reviews of them before next week. In the meantime, how is your Tag Sale going? Previous Post Get a sneak peek at Anthropologie’s Spring 2017 collection!! Next Post Nordstrom launches a well-timed coat sale! Thanks for the reminder about the popbacks, Roxy. The dress I bought in the wrong size over the weekend was back in stock so i quick snapped it up. Only one so I hope it ships! Now I have an excuse to go to the store as I have to return the one I have. Think I'll see if there are any more of the Fictions perfumes around. All the Fictions perfumes were gone from my store yesterday, but good luck! Thanks! I found the Istanbul one, I just got the travel size and a couple of the Mer-Sea body lotions. But now the popback dress order says it's backordered. Do backorders actually ship? A sale top I ordered on 12/30 also changed to backordered status shortly after placing the order. No further updates since then. A cancellation would not surprise me, but who knows. oh dang it, yeah that's what I'm afraid of. Just got the cancellation notice for that backordered item from 12/30 above. . . . .
Well now the backordered dress is back in stock again, so I'm hoping that's a good sign that my order will actually ship. I had an item that shipped after 6 days in my first Tag Sale order. Keep the faith! Backordered on sale items usually means they're waiting for a return to get back to the warehouse. All sized of the gray color of the blocked sherpa bomber are in stock right now. I highly recommend this one and really like the gray color over the oatmeal color. In my opinion, this fits TTS. Had 3 $9.95 pop backs cancelled yesterday after a couple of days, but got some more today if those don't get cancelled too! Yay! Here's hoping they ship. I think I picked up the tester by mistake. The seal was broken on the box and the cap was completely unscrewed and loose. The weird thing was it didn't smell like perfume! Somebody must've dropped it then snuck it back in there or something. Hi everyone happy new year. I got a lone Deletta green sleeveless peplum top for under $10, the essential flare crops in green for under $25, one pair earrings under $20 & one pack of 80 gift labels (for next Christmas) for about $3. I only go in the store for the tag sales & must watch the budget so I'm very happy. As for tag sale – Anthro cancelled 2 items from my orders. The least expensive 2 items of course which had me fuming. There's nothing remaining that I have interest in but I am happy with the items I did receive. Ooooh that is exciting!! Hope you love them. I scored the tegan tunic as a popback for $30! Awesome! I have the Tegan in 2 colors and it's one of my favorite dresses ever. I want to wait until later this week as there are a lot of new arrivals yet to drop. As far as cancellations, it has been 50/50 for me. I ordered 7 sweaters/tops and 4 cancelled including one pick up in store sweater. I'm still happy about the few that I did receive, but I'm hoping the military sweater jacket might pop back in XS. Love my Tegans. I have 3 I'm only missing red and taupe. If I see those in my size I'm snagging them. I got one too in navy blue. Oh that can happen. There was a tester left a couple of days ago that I thought was just missing the box, but I realized after I got home that it was the tester that was there when I bought my bottle (I didn't look at it there and my friend said she wanted it but I realized it was the tester, so I didn't go back for it). All but one of my recent orders have been cancelled. Sigh, so frustrating! In trying to track down a size online, I found myself in the mysterious waters of anthropologie sold on ebay. Does anyone know where sellers get Anthro merchandise where the store has marked a black line through the tag? Does it mean the items were purchased from Final Cut? Or do anthro stores actually sell sale items with a black line through the tag and I've just never seen it in all my years of shopping there? Just curious where they get their items from! I've bought a few great Anthro classics on eBay but have never encountered a black line through the tag. Sorry, have no idea what it signifies. I know there are a few resellers on there that have a sketchy amount of unworn, tagged Anthro merch that seems to have come right from the warehouse. Maybe others know more? Maybe the seller marked the line through the tag? Anthro stores don't mark a black line through the tag. I think the ebay sellers are doing it themselves or maybe they do it at Final Cut, I'm not sure. I have a few items from Final Cut. They cut the brand tag (Pilcro for example) in half but no black lines at least on my purchases. On the other hand, I vaguely recall a BCBG Final Cut outlet using the black line mark-through method. Thanks all for your replies! I was just curious if I was about to purchase something that was sketchily sourced. I've also been seeing some Anthro brands (like Tabitha) popping up randomly at TJ Maxx recently. Thanks again! Anthropologie might sell off some of its clothing to discounters (i.e. TJ Maxx,etc.) and they often will black line prices. Also, some second-hand stores do this to prevent returns back to the original store. I have seen Anthropologie in-house brands at TJ Maxx lately (never had before) and they all had a black line through the label. If you are in the Atlanta Georgia area, Anthro at Lenox mall has several Velvet Frost Dresses available. I cannot pull it off because of my height. But I saw a few this weekend there. I just noticed the 3 $9.95 orders of mine that got cancelled are the ones that didn't show 40% off in my shopping cart. I had to call CS to get it adjusted. Too bad because there's a pair of $19.95 jeans I really wanted that I had to call about yesterday because the 40% off wasn't showing, so now I know it will probably be cancelled. I just checked and the jeans were shipped, so scratch that theory lol. Is it normal to not be able to see all your orders on the website? I can only see one page of orders and when I go to the next page to see my older orders it stays on the first page. I have the same issue on both desktop and iPad but all orders show on Anthropologie app on my iPhone. I've noticed this as well. I'm not sure how to access orders beyond the first page anymore, as I couldn't even find a place to type in the order number for earlier orders. Try logging out of your account and use the order status link at the bottom of the page. That is the only way I can access orders placed beyond my first order history page. Hope this helps. Thanks, I'm just going to look them up in my email account instead. Yes, I also noticed the page/area where you could type in just the order number was gone. I needed to check on a past order and only had my first page to see online. On the app, I can get my complete order history. I stopped by the Newport Beach store today and their sale section was just as packed as the day after Christmas. The sa told me they had a lot of sale items in their back room and still have some back there. But I found some goodies that were hiding in the back all this time. Worth another trip to the store since the website seems picked over. Wish they had everything in stores because I'm tired of paying for shipping that's a risk if the thing doesn't fit or doesn't look good on me! If you are in a store they can place an onine order for you with free shipping. I've even called in and they placed an order for me and waived shipping. Thanks, I can try that but I'm mostly talking about popbacks. Or if they would refund the shipping when you return something, that would work too! Hi All- For those looking for the hot buttered rum candles, the 5th Ave and 17th Street (NYC) has a basket full of them (at least the did at lunchtime today!. After it was sold out online, I found a pair of the Oro Sequined Joggers so I snagged them! Wish they had free shipping. I hate losing $7 to $14 on orders I have to return when they don't fit. I thought I was out of luck on the Marilyn Dot skirt when it sold out then it magically turned up as a pop back on Christmas Day, on sale plus 40% off. Thanks, Santa! I got it today. If I ordered something from the sale that doesn't fit and my size is not available online but other sizes are, can CS find out if there are any others in my size and if so can I have it shipped without paying for shipping again? I'm just going to wait to see if it pops back later when it gets another cut in price or if I can find it in store. I think it's still too much right now even with the 40% off. You can call your store to do an inventory search. Then locate the item in a store and call that store to do a charge send for free shipping.